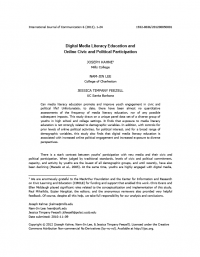 Can media literacy education promote and improve youth engagement in civic and political life? Unfortunately, to date, there have been almost no quantitative assessments of the frequency of media literacy education, nor of any possible subsequent impacts. This study draws on a unique panel data set of a diverse group of youths in high school and college settings. It finds that exposure to media literacy education is not strongly related to demographic variables. In addition, with controls for prior levels of online political activities, for political interest, and for a broad range of demographic variables, this study also finds that digital media literacy education is associated with increased online political engagement and increased exposure to diverse perspectives.